On this day 7th Feb 1917. 100 years ago today, a verdict was passed down on a murder that had taken place earlier on Dec 6th, 1916. Horrace Lewis had returned from the war the day prior to the murder of his wife. He had been heard to tell Eva Lewis that he would not live with her anymore and had charged her with infidelity to him with another man, Barrett, during his absence at the war. He had also just heard that Barrett had given his little son a thrashing which had angered him, although he denied being angry in court. Martha Terrace, Horrace Lewis’s sister had until this point been on very good terms with her sister-in-law Eva and witnesses stated that they seemed still to be shortly before the incident. They had even had lunch together at Lewis’s home, with Martha kissing her goodbye as she left. Witnesses stated that on the afternoon of the murder, an argument broke out between Martha and Eva Lewis after Martha had paid Eva a return visit. Witnesses heard Martha demand of Eva “What did you say to my mother?” and with that Ava Lewis punched Martha between the eyes, sending her backwards and causing Martha to hit her head against the fence. A fight broke out for a couple of minutes with Eva Lewis also heard to say “I’ll choke the life out of you” as she clutched Martha’s throat. It was said that Martha was struggling against Eva for her life, palms outstretched as she attempted to ward her off. Eventually the fight broke up after a neighbour shouted at Martha to go home, and with blood seeping from one of her eyes, Martha Terrace picked herself up and walked away, coiling her hair back up as she went. As she walked away Eva Lewis laughed at her and stated how for a larger woman she certainly came worse off and then shouted after her “If you want any more you can go home and bring your husband and brother-in-law and the lot. You’ll get more then you bargained for”. The neighbour who was a witness, thought that Martha Terrace had come out the worse, as she saw the blood from Martha’s eye as Martha had left. She watched as Eva Lewis returned to her house and went inside. About 10 minutes later she emerged once more and this time had blood on her blouse and was in a state of collapse with two wounds in her back and chest. Martha Terrace was arrested and taken to the Adelaide Gaol to await trial. At trial, at no time did any of the witnesses see Martha with any weapon in her hands. In fact witnesses had seen Eva Lewis walk back into her house still shouting and mocking Martha as she walked away. No weapon was ever found, even when Martha’s house was searched. It wasn’t until after Eva Lewis came out of her house a second time that blood was noticed on her blouse by any of the witnesses. For this reason on 7th Feb, 1917, Martha Terrace was acquitted of the murder of Eva Lewis. She was no doubt very relieved, especially as she would have been very aware, whilst sitting in the Adelaide Gaol, of the execution only 34 years earlier of another lady accused of murder… Elizabeth Woolcock. It remains a mystery as to who really killed Eva Lewis. On this day two young lads, Samuel Moyle (15 years) and John Haggerty (17 years) received the first part of their sentence. The two young men had committed separate, but identical crimes and both were sentenced by Justice Boucart. Part of their sentence included strokes of the lash, to be carried out on the same day at the Adelaide Gaol. They received their punishment on the morning of the 12th Dec.
On the 16th August, Margaret Hayes (12 years) who lived in Willunga, left school and began to walk home. Samuel on seeing Margaret, followed the little girl from her school, for the express purpose of gratifying himself with her. He was quickly arrested and taken to court where Samuel pleaded guilty. His Honour stated that it was terrible to see a boy charged with such an offence, and even exclaimed that he was astounded. He pointed out that none the less, this boy had terribly injured this girl and in any other colony, the sentence would have meant death or Gaol for life. Instead he sentenced Samuel to 1 month in Gaol, 15 lashes and then Samuel was to be kept in the boys reformatory until 16 years of age. On the 15th Nov, Mary Brewster (23) of Quorn, had been taking a message to a neighbour when she stumbled across John. He grabbed her and after a severe struggle, he raped her. Mary stated in court that she had seen John stop to give his horse a drink and when she got close to him, he had asked her the time. She replied she did not exactly know and hurried on her way. He quickly caught up to her and threw her down to the ground. “Do you not have a conscience?” Mary cried out during the violent struggle “No” he replied. Once finished, John then got on his horse and rode off. In the court her torn clothing, was produced. Her neighbour attested to the state Mary was in when she finally arrived at her house, and said her face, ear and wrist were bleeding. The jury only took a few minutes to find John guilty, but did ask for mercy due to his age. Justice Boucart once more reminded John that in other Colonies, he would have been given the death sentence before he sentenced John to 5 years hard labour and 20 lashes. On Weds morning, 12th December, in the presence of Mr Howell (Governor of the Gaol) and Dr Patterson (Colonial Surgeon), the strokes were given. These were administered, as often done so, by the executioner, Earle. John, as he was older and his crime more violent, was given the cat-o-nine tails. Even before the first stroke was given, he started to howl and pray for mercy, which turned to shrill yells as each stroke was given. It was said “they could be almost heard as far as Bowden.” He was described as a man of ‘robust physique and possessing lungs of extraordinary power! He fainted part way through, but was soon brought back to consciousness with plenty of water. It was viewed by the South Australian Weekly Chronicle, that the punishments were much deserved and if given more often, would deter ‘many big cowards’ from crimes of a similar nature! 4th Feb, 1855 a letter was sent to the Editor of the South Australian Register by a spectator to Corporeal Punishment. He sent an appeal to have it abolished having been witness to a flogging and was disturbed at the brutality of it. He was not against punishment in general, just the barbaric 'torture' of flagellation. "Mr Editor, this sort of thing belongs to the 17th Century, and is everywhere execrated. It is the means employed where Lynch Law and vengeance are used by an unorganised body in a newly founded colony"
​He went on to point out "What strikes me as singular is that we are, very properly, not allowed to exercise cruelty towards a stubborn horse; and yet that the man who rewards another for imprinting long bloody furrows in the back of a human victim is countenanced by the leading members of a Christian community." "No, No - this thing must not be suffered by this fair land, whose hills and dales have never echoed back (until lately) the groans and shrieks of humanity extorted by those who exult in destroying the muscular and nervous system of their fallen fellow man"
"Corporeal torture cannot be deserved - it is revolting to man, accursed to God"
His thoughts fell on deaf ears as flagellation was to continue as a punishment for another 109 years at the Adelaide Gaol. In fact when the Beatles visited Adelaide, we were still giving prisoners the 'cat o' nine tails'. We finally stopped in 1964. Was John Balaban our first Serial Killer? On this day – 26th August 1953, John Balaban had the dubious honour of being the first person to be hanged in the newly converted Hanging Tower at the Adelaide Gaol. John Balaban was a 29 year old Rumanian, who was definitely not a stupid man. In fact he had obtained a degree as assistant engineer in physics and metallurgy when he was only 19 years old. He joined the army in 1947 before escaping to France in 1948, where later he admitted to making his first kill - a woman he had strangled to death after “making love to her”. Her murder remained unsolved until John Balaban made his confession five years later. at the Sunshine Café in Gouger Street. However, Balaban was becoming increasingly unhappy and blamed this unhappiness on his wife. Finally on 3rd December 1952, he walked out. 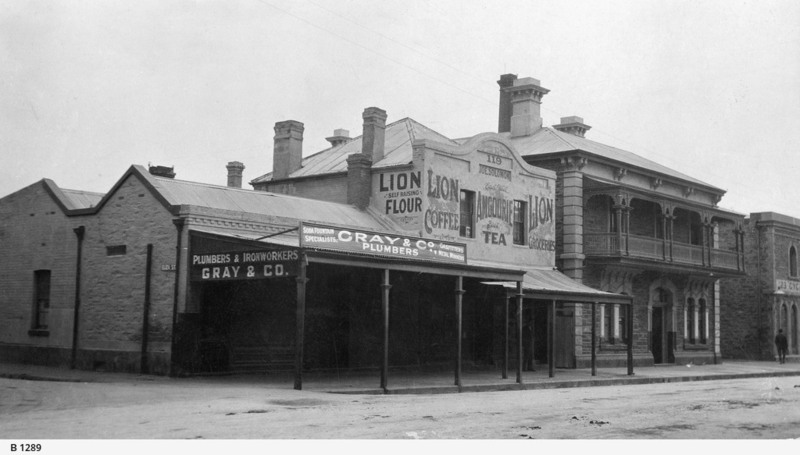 Only two days later, while drinking at the Royal Admiral Hotel on Hindley Street with some friends, Balaban met Zora Kusic and after a drink or two Zora invited Balaban back to her shack at Torrensville. While in the cab, Zora made the fatal mistake of admitting to Balaban that she was in fact a prostitute, and then requested five pounds for her services. Disgusted that she was just a ‘common prostitute’, he became enraged and strangled her, before cutting her throat with a knife and slitting her stomach and chest open. Balaban was arrested and in January 1953, was sent to trial which only lasted 5 days, before he was released due to there not being enough evidence. This fatal mistake cost the lives of three more innocent people. Returning to his family in February, conditions did not improve and he became more and more unhappy until on the 11th April 1953, Balaban decided to go out for a drink and ended up attacking a young lady in a women's toilet block, taking an iron bar and assaulting others, even putting one in hospital with head injuries. On returning back to the Café that night, briefly he wondered what his wife would say to him being dirty and covered in blood. It was at that moment he decided to cure his unhappiness once and for all, took a claw hammer and beat his wife to death. He didn’t stop with his wife, he continued his violent spree by taking the hammer to his mother-in-law and also to poor little phillip, both who survived their ordeal for a few days before finally succumbing to their injuries. It was while attacking the girl who worked there, that she managed to escape by jumping out of a window and raised the alarm. Balaban was arrested and taken to the Adelaide Gaol, tried and found guilty of the murder of Zora Kusic. He was sentenced to hang by the neck until dead. On the morning of the execution the police closed off Gaol Road, but they needn’t have worried, as the execution of John Balaban failed to incite even one member of the public to demonstrate against it. It wasn’t just the public that had little sympathy for him, but he was unpopular with the guards too, especially as he had savagely attacked a prison warder, whom he tried to throttle before being overpowered. John Balaban showed no remorse for what he had done, and stated that they deserved to die. He even claimed that Philip was a mercy killing as he would otherwise have lived his life under a dark cloud. At 8 a.m. on 26th August 1953, John Balaban became the 42nd person to be hanged in the Adelaide Gaol. A young, stout looking lady nervously stood in the dock, with her head hung low and pleaded "Not guilty" to the murder that she was now accused of. Fanny Port had been in the service of Arthur Horrocks, a farmer in Penwortham, Clare Valley, for around 4 months as cook and general servant. Arthur Horrocks was the brother of the famous explorer and pastoralist, John Ainsworth Horrocks. One morning, he found her crying and upon asking what was wrong, she stated that people were endeavouring to injure her good name by spreading rumours that she was pregnant. Horricks tried to reassure her that if this was the case then she should be afforded help and all the attention she needed. She thanked Horrocks for his kind offer, but refused to admit to the pregnancy. A little later, and still suspicious, Horrocks searched her room and found evidence to suggest that the rumours were true. Fanny finally admitted to having already giving birth, and told him the baby had died and was buried only 50 yards from the house. Worried that she had hurt the child, he asked her the question, to which she replied “Oh no, Sir, I would have kept it had it breathed” she also added “it was a very pretty little girl”. Fanny took him to the spot where she had buried her baby and he marked the spot before sending word to the local Magistrate. The police arrived and soon after exhumed the body, being careful not to damage it in any way. The dead body of the child was quickly taken to Clare for examination. Despite Fanny’s insistence that the child had not breathed when born, the examination by Dr Foster Steadman, showed otherwise. They tested the lungs and they floated… a sure sign, he said, that the baby had been breathing before she died. The valve in the heart was closed also, another sign that the baby had been alive when born, and that there had been circulation. The head was exhibiting discolouration from extensive bruising and the scalp was swollen. After removing the scalp, the examiner found blood on the skull from internal bleeding which, he believed would have been the cause of death. He did not consider that such damage would be done through childbirth, but would have to be delivered by blows from a blunt source, possibly knuckles. He could not find anything else to account for the child’s death. Mr Parker, for the defence, argued that no child's cry had been heard and that Mr Horricks had witnessed only weeks earlier, Fanny preparing clothing for her child. He pointed out that she had always been of a kindly disposition towards other people’s children and that it would be out of character for her to ever harm a child, never mind her own. He reminded the jury of Fanny’s comment, said with fondness “it was a pretty little girl”. He put to the jury, if there was any doubt at all in their minds, they must not find her guilty of murder but that the crime of concealment would be more fitting. With that, the Jury retired and returned with the verdict of Not Guilty of murder, but guilty of concealment, which was in those days, a crime in itself. Mr Justice Cooper proceeded to pass sentence in a low and solemn tone. He reminded her that a kind offer of help had been offered, and that her refusal of that help, had no doubt contributed to the death of her child. For this reason he felt that he should give maximum sentence for the crime she had been found guilty of. On the 9th August 1853 Fanny Port was sent to the Adelaide Gaol for 2 years, with hard labour. Alison Oborn, Adelaide Author and award winning tour operator, is also a history & heritage enthusiast. She has been a volunteer guide, Information Officer and Researcher at the Adelaide Gaol since 2002. Adelaide's Haunted Horizons Ghost Tours, which operate Ghost Tours and Dark History Tours in the Adelaide Gaol, at Z Ward, National Railway Museum, Tailem Town, Adelaide Arcade, Moonta and Burra. © Adelaide Gaol Heritage Site - 2014. No reproduction of any material on this site to be used without permission.